Pets allowed – Yes, on request, only small size and with a supplement of Euro 50,00 for the cleaning. It is only accepted in some rooms, which will be partially set up differently (no carpets, no rugs etc.) and a bowl and an absorbent blanket will be provided. The pet can not be taken in the common areas and it should be accustomed to be alone without causing noise and / or inconvenience to neighboring rooms. The green countryside of Umbria be enjoyed all around the Relais, set atop a hill a few Km from Todi and offering a 360° panoramic view. The Relais Todini is surrounded by an estate of about 1000 meters, where vineyards grow up and frame the landscape. The building is an ancient manor dating back to the XII century, but whose architectural roots date back to the Etruscan-Roman period. The Relais Todini is supplied with ancient furniture, tapestries, fireplaces and boasts rooms with frescoed walls, made of brick and stone. The atmosphere is luxury and welcoming; it brings you back in time as you can still feel and breathe the history of the Relais. The exclusive Relais Todini disposes of 8 rooms and 4 Suites, offering amazing views over the countryside and equipped with all comforts. 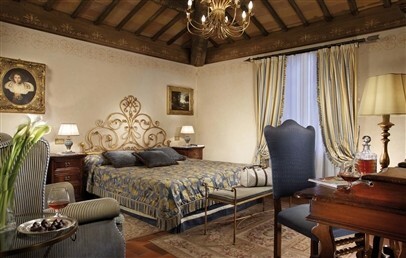 The guests can choose among: Classic rooms, Superior rooms, Suite and Suite Superior. Classic – Two classic rooms available, one with double bed and one with twin beds. View over the valley or the city of Todi. Superior – more spacious compared to the Classic rooms, they have free Internet access and overlook the city of Todi or the garden. 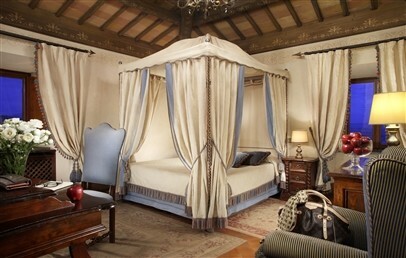 A special Superior room for romantic stays dispose of four-poster bed). Pets allowed. 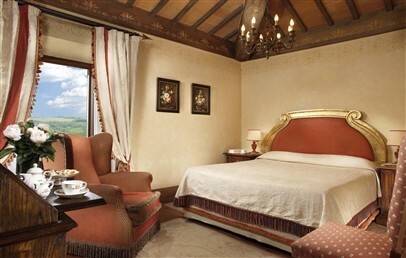 Suite – Bedroom and living room with enchanting view over the countryside. Bathroom with shower. Suite Superior – Suite with bedroom and separate living room with sofa bed. Bathroom made by stone from Assisi and rain shower. The comfortable Spa of Relais Todini offers various spaces to relax body and mind, nestled in the quiet Umbrian countryside. The particularity of the Spa is the Wine therapy, which includes baths and special rituals made with the grapes produced in the estate. The Spa offers an outdoor Jacuzzi, a Turkish bath and an equipped gym. Closing day: Monday. Elegance, attention to detail and an excellent selection of wine labels from the Todini cellar, including the DOC and ITC wines produced by Todini company. The restaurant "L'Altro Vissani Todi" of the Relais Todini offers authentic flavours from Umbrian tradition as well as tasty dishes. During the warm summer months a brunch is served by the pool for lunch, while on the weekends and for dinner the service is à la carte. During the winter period the restaurant is closed for lunch during the week; it is open for dinner during the week and also for lunch on weekends with an à la carte service. Closing day: Monday. The surrounding nature and the wonderful landscapes can be enjoyed with one of the excursions organized by the Resort: hiking, mountain bike tours through the vineyards, olive groves, artificial ponds and luxuriant forests. Additionally, more about the food and wine culture can be learned with the cooking classes and the wine tastings. 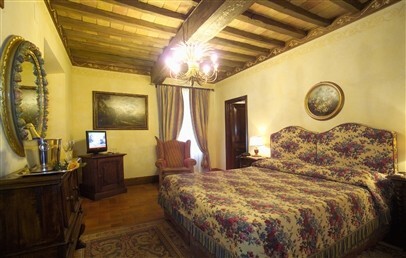 Double or twin rooms furnished in a warm and welcoming style typical of the Resort, with stone and brick, frescoed walls, fireplaces, tapestries and paintings. One Classic room is on the ground floor and opens into the garden; the other Classic room is on the second floor and overlook the city of Todi. Bathroom with shower. Pets allowed. Double or twin rooms located on the garden floor, on the first or second floor. They are furnished in a warm and welcoming style typical of the Resort, with stone and brick, frescoed walls, fireplaces, tapestries and paintings. Bathroom with shower (one of the Superior rooms features a Jacuzzi), free Wi-Fi, view over the garden or the city of Todi. Pets allowed. 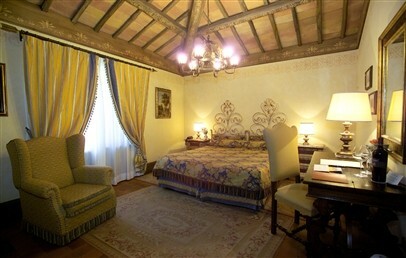 Double room located on the second floor; it is the more romantic room of the relais. It is furnished in a warm and welcoming style typical of the Resort, with stone and brick, frescoed walls, fireplace, tapestries and paintings. Bathroom with shower and view over the city of Todi. Suite with bedroom and separate living room with single sofa bed. They are furnished in a warm and welcoming style typical of the Resort, with stone and brick, frescoed walls, fireplaces, tapestries and paintings. Bathroom with shower and view over the valley. Suite located on the first or second floor, composed by a bedroom and a living room with sofa bed. They are furnished in a warm and welcoming style typical of the Resort, with stone and brick, frescoed walls, fireplaces, tapestries and paintings. Marble bathroom with shower. View over the valley or the city of Todi.